In his second contribution to this forum, Michael Oard asserts I am profoundly misinterpreting several prominent features of the Earth. But in making this accusation, Oard is placing himself under serious obligation to provide the correct explanations. Since I have already addressed most of his technical objections in my earlier contributions, I think it proper to focus a bit more attention on Oard’s own explanations. Indeed, if the plate tectonics paradigm is as defective as he would have us believe, then it should not be that difficult for him to provide a positive alternative. And if he had such an alternative, he would surely be focusing more of his attention on its superior explanatory power. But Oard does not have any serious alternative. He offers no coherent explanatory model for the primary tectonics features of the Earth. He has no answers for the structure, location, or origin of the mid-ocean ridge system, or of the continental mountain chains, or of the ocean basins themselves. He provides no explanation for the distribution of sediment on the ocean floor or its fossil content or the correlated orientation of its magnetic mineral grains. He has no credible energy source or mechanism that could have produced the young tectonic features we observe on our planet today within the Biblical time constraints of the Genesis Flood. In short, Oard gives little indication he is engaged in a constructive quest for truth. I firmly believe it is time for creationists to move beyond such negative tactics, especially when God in our day has given us a compelling outline of how a global tectonic cataclysm can occur. I use the latter portion of this third contribution to summarize, through the use of a computational example, the physics responsible for catastrophic plate tectonics—physics that stands as independent support for the paradigm. Let me begin by affirming without apology that indeed I am persuaded the basic mechanical reality of plate tectonics has been established beyond any reasonable doubt. 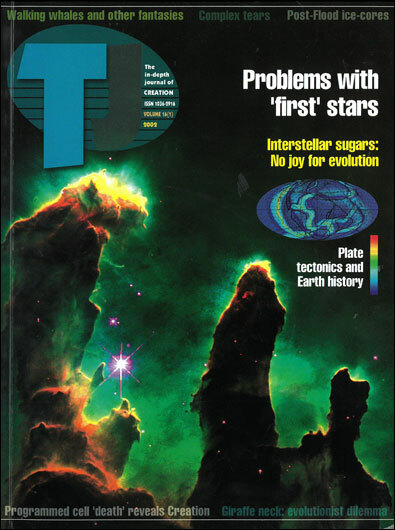 Much of my first contribution was devoted to summarizing the various lines of discovery that led to the general acceptance of plate tectonics, and in my second contribution I pointed out that support for this position is vastly broader than Michael Oard leads his readers to suspect. I also showed that most of his criticisms are caricatures of what the data in question actually reveal about the Earth. In his second contribution, Michael Oard accuses me of misinterpretation of data in regard to the fit of the continents, the reality of magnetic reversals, the age distribution of the basaltic ocean crust, and the nature of the Wadati-Benioff zones. In so doing, he has placed upon himself a significant obligation to provide correct alternative explanations. However, when one scrutinizes his alternatives, one finds them technically indefensible. Perhaps that is why, instead of spelling them out plainly, he mostly points to references he knows most readers will not take time to check. In regard to the matching shapes of coastlines across the Atlantic, just what is Oard’s explanation? His words in his first contribution are brief and cryptic. He suggests ‘integrated subsidence and uplift during one global event’ and ‘differential vertical tectonics in a common stress field that occurred in one worldwide event, namely, the Genesis Flood.’ But what does this mean? It means the region now occupied by the Atlantic Ocean sank relative to the continental regions on either side. But what mechanism would cause this region to violate isostasy prior to the Flood? Why would the region now occupied by the Atlantic Ocean, devoid of the 35-km-thick layer typical of buoyant continental crust, not always lie several kilometres below sea level? Mr. Oard provides us not a single clue. Although he uses technical terminology, what he is presenting is technical nonsense! He offers no mechanism. He does not mention the vast difference in crustal structure between ocean and continent. He does not deal with the issue of isostasy. Moreover, he has no explanation for the high elevation of the Mid-Atlantic ridge, or the topographical variation as one moves away from the ridge, or its symmetry relative to the Atlantic margins, or its high heat flow, or the distribution of sediments on its flanks. What he claims as an alternative explanation has no substance whatever. What is Michael Oard’s approach to magnetic reversals? It is, incredibly, to deny they exist. Pretending that the only data to be accounted for is that associated with the basaltic ocean crust, Oard offers as an alternative explanation, spatial variations in the magnetic susceptibility. But variations in magnetic susceptibility emphatically cannot explain the reversed direction of magnetization in continental basalt flows widely observed for almost a hundred years, nor can it account for the well-documented reversed orientations of magnetic minerals in deep sea and lake sediment cores. (And neither can they plausibly account for the very real magnetization patterns in the basaltic seafloor.) Even though I emphasized these observations in my first contribution, Oard ignores these data entirely and offers an irrelevant explanation. Magnetic reversals in the rock record are a reality, and a mechanism by which they may occur rapidly has been offered in the creationist literature.1 Mr Oard’s alternative explanation does not address the evidence. Furthermore, he continues to confuse the issue by insisting the concept of magnetic reversals is inescapably linked to radioisotope dating. But Oard’s logic is faulty here, as I have explained previously. Just because radioisotope methods have been applied to the study of magnetic reversals by evolutionists does not automatically imply magnetic reversals are an illusion. There is simply no excuse for such faulty reasoning. Figure 1. Snapshot of 3-D-computer solution after 15 days of simulated time. 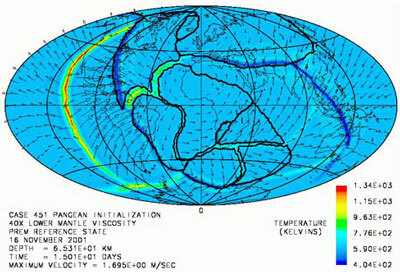 Upper plot is an equatorial cross section in which colour denotes temperature variation from the mean at a given depth. Arrows denote velocities in the plane of the cross section. The lower plot is an equal area projection of a spherical surface 65 km below the top surface in which colour denotes absolute temperature. 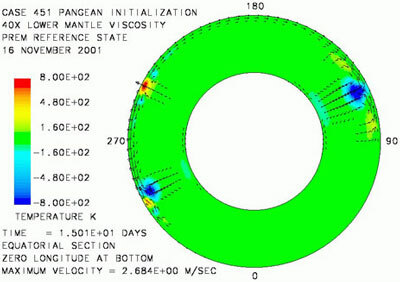 Arrows denote velocities. The dark lines denote plate boundaries where continental crust is present or boundaries between continent and ocean where both exist on the same plate. What is Michael Oard’s position on the age of the basaltic ocean crust? This he keeps a well-guarded secret. But his vigorous opposition to any form of plate tectonics and particularly to the idea that all the basaltic ocean crust can be no older than Mesozoic logically implies he holds that all the basaltic ocean crust is of pre-Flood age. If this is his position, he is under obligation to address the obvious question of why no fossils of Paleozoic affinity have been found in any ocean floor sediments anywhere in the world. Oard is completely silent on this crucial question. At issue are not details about fossil succession as Oard might have us believe, but rather why the entire spectrum of fossil types of organisms so well documented in the Paleozoic portion of the continental record are nowhere found in the ocean sediments. Moreover, he is completely silent regarding any explanation for why the ocean floor sediment distribution should be so closely correlated with the distribution of mid-ocean ridges. In my assessment, Oard’s position that all the present day ocean crust is of pre-Flood age is patently indefensible. I suspect he knows this, given his reticence even to reveal his position, much less to offer any defence of it. Next, concerning Wadati-Benioff zones, what is Mr Oard’s alternative explanation? On this question, he restricts himself to Wadati-Benioff zones beneath ocean island arcs in the western Pacific Ocean and neglects the more common situation of such zones beneath continents at continental margins. His cryptic explanation is ‘a rising mantle wedge’ beneath the island arc. But he provides no details as to what might cause such a phenomenon, or how it relates to the Flood catastrophe, or how such a mechanism might apply to the more common situation of Wadati-Benioff zones beneath continents. In short, there is no serious content to his explanation. It is as if he just pulled words out of the air. To provide some justification to his idea, he claims that high heat flow in back arc basins behind island arcs is ‘anomalous’ in the plate tectonics framework. This is simply not true. Back arc spreading and associated upwelling of hot mantle rock are consequences of the well-understood mechanical tendency of the bending axis of a subducting plate to migrate in a backward sense relative to the plate motion. This occurs because there is a downward component of plate motion at the bending axis in addition to a horizontal one. Back arc spreading is a mechanical consequence. Furthermore, his criticism that the patterns of earthquakes associated with Wadati-Benioff zones are too complex is based on his own peculiar mental conception of plate tectonics that somehow requires the Earth to behave in an implausibly simple way, as I pointed out in my second contribution. As a final point, I would like to address Michael Oard’s general rejection of the concept of fossil succession in the geological record. Fossil succession represents an undeniable reality of what creationists and evolutionists alike observe in the rock strata. For example, we find no archaeocyathids, a vase-shaped coral-like organism with a double-walled calcareous skeleton, above middle Cambrian strata. We find no pentamerus brachiopods or cystoid crinozoans or psilopsid plants above Devonian strata, no graptolites above Mississippian strata, and no trilobites or rugose corals above Permian strata. On the other hand, we find no birds or angiosperms in strata lower than Jurassic, no mammals in strata lower than upper Triassic, no reptiles in strata lower than Pennsylvanian, and no amphibians in strata lower than Devonian. A similar unmistakable sequence of types also exists in the case of the microfossils. One can personally examine the actual physical sequence of rock strata with their fossils, starting, for example, at the bottom of Grand Canyon and continuing up onto the Colorado Plateau at Bryce Canyon. Independent of the names and geological periods that have been assigned to them, these rock units indeed have genuine identity, can readily be tracked laterally for hundreds of miles, and display an unambiguous vertical fossil sequence for anyone who cares to look. Creation tours actually provide this opportunity on a frequent basis. Oard cannot provide a rational defence for his denial of such observable reality. Creationists have long recognized this ordering in the fossil record and have related it to the progressive destruction of ecological habitat as the transgressing waters of the Genesis Flood reached higher and higher topographical regions of the planet. Oard in his mind seems to be equating fossil succession to evolution, not understanding that evolution is merely the interpretation evolutionists are imposing on the observed data. If we as creationists are to make genuine progress in reconstructing the actual history of the Earth in light of God’s revelation, we simply cannot afford such denial and misrepresentation of crucially important information. The approach I have been pursuing for more than twenty years has been to seek to develop a positive model for the Flood catastrophe that supersedes anything the evolutionary establishment can offer. This effort has involved examining the temperature- and stress-weakening properties of silicate rock in the presence of gravitational body forces inside a planet like the Earth, particularly with numerical modelling techniques. In my first contribution to this forum I provided a brief description of 2-D results that reveal catastrophic runaway can occur, with silicate rock weakening by factors of a billion or more throughout most of the volume of the mantle during a runaway episode. Here I would like to briefly describe results from a 3-D spherical shell calculation that builds upon these 2-D results. 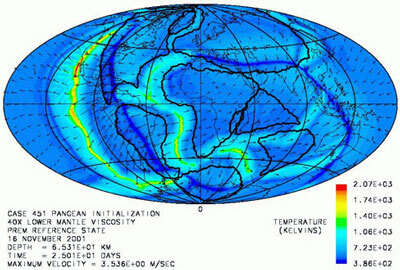 Details of the theoretical formulation and numerical methods are summarized in a paper I presented at the 1994 ICC.2 The case presented here has a horizontal resolution at the Earth’s surface of about 120 km, which is twice the spatial resolution of the case described in the 1994 paper. As in the earlier work, the approach is to solve equations of mass and energy conservation and a balance of forces for each cell in the computational grid. The forces include, first of all, a buoyancy body force that arises from gravity acting on density variations due to the variations in rock temperature. These buoyancy forces in turn are balanced by the forces arising from rock deformation and from the local variations in pressure. The basic formulation is just that simple to grasp and comprehend. Figure 2. Snapshot of computer solution after 25 days of simulated time. Colours and arrows denote the same quantities as in Figure 1. In addition, there is a representation of plates applied at the surface of the spherical shell domain. Plate identities are tracked by particles that move with each plate in a self-consistent manner. A set of rules for the particles governs the interactions of the plates at their boundaries. Where plates diverge, new particles are added in a manner that represents symmetric cooling on either side of the existing plate boundary. Where plates converge, particles are removed to represent subduction if ocean plate lies on at least one side of the common boundary. Where one side is continent and the other side is ocean, it is the ocean plate that disappears. When both sides are ocean, symmetric removal of plate is enforced. If both sides are continent, equal and opposite normal forces are applied to both plates to model continent-continent collision. The initial shape and extent of plates, including the distribution of continental crust, is specified as an initial condition. In the case presented here, the initial plate configuration is an approximate reconstruction of Pangea based on present-day continents and data from the present-day ocean floor. An initial temperature perturbation is required to initiate motions within the spherical shell domain that represents the Earth’s mantle. For this, a temperature perturbation of -400 K to a depth of a few hundred kilometres is introduced around most of the perimeter of the supercontinent. Otherwise, the initial temperature within the interior of the model is laterally uniform. Solving the equations of mass and energy conservation and force balance from this initial state yields a solution in which subduction of ocean plate occurs around most of the margin of the initial supercontinent and the continent blocks comprising this supercontinent are pulled apart. Snapshots are shown in Figures 1 and 2 for times of 15 and 25 days, respectively. The resulting pattern of seafloor spreading and continent motion, while not identical to what is inferred for today’s Earth, is remarkably similar, particularly given the simplicity of the model and the deficit of detail in the initial conditions. The short timescale is a direct consequence of using the same reduced viscosity observed to occur during a runaway episode in the 2-D calculations. Simulating runaway conditions directly requires the high spatial resolution currently feasible only in two dimensions. The reason most of the mainstream geophysics community have not obtained such runaway solutions is simply that a deformation law for silicate that accommodates realistic levels of weakening has not been included in their models. This 3-D calculation is intended only as an illustration of the style of the catastrophic tectonics and mantle motions that unfolded during the Genesis Flood. The calculation obviously does not capture the earliest portion of the cataclysm that corresponds roughly with the Paleozoic part of the rock record. Explicit modelling of this earlier portion of the catastrophe will be difficult to achieve because the ocean floor from this period is no longer available and clues from the continental rocks are few. Recovering even approximate initial conditions for this earlier state appears extremely problematic for anyone’s framework. 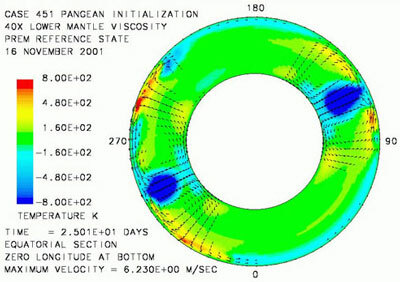 Nevertheless, this present calculation illustrates vividly the energy-conserving mechanical processes of buoyancy driven flow responsible for the motions and behaviour of the tectonic plates. In this light, Michael Oard’s assertion that the mechanism of plate tectonics is yet to be elucidated is plainly unsupportable. The calculation also reveals how the African and the Antarctica plates can both be almost completely surrounded by mid-ocean ridges. Furthermore, the calculation demonstrates in a straightforward manner how most of the primary tectonic features of our present-day Earth, including the large mountain chains, the mid-ocean ridges, the ocean trenches, and main volcanic belts have come about. And details concerning fossil successions, radioisotope dating, variations in magnetic susceptibility in ocean floor basalts, and complexities of earthquake distributions play absolutely no role as far as the vivid expression of the basic laws of physics in these calculations is concerned. When one examines Michael Oard’s own alternative explanations for the tectonic features of the Earth, it should be plain he is not concerned with serious alternatives to the paradigm he is attacking. Instead he is engaging in a campaign to raise doubts in the minds of Christians regarding the prevailing framework. I believe we as creationists can do much better than that. I am persuaded we possess the ability to sort truth from error and discern what is uniformitarian fantasy from what is genuine reality. Just as evolutionary scientists for the most part discovered and elucidated the details of genetic language, which we now realize can only come into existence by wilful action of a Superintelligence, secular scientists for the most part have assembled the beginning of a conceptual framework that, whether they realize it yet or not, now makes possible a serious defence of the Genesis Flood. In my view, as creationists we should be labouring with every resource we have at our disposal to bring to fruition a comprehensive Flood geology model/framework that accounts not only for large-scale tectonic phenomena but also for details of sediment deposition and erosion patterns and tectonics at a regional and even local scale. I believe such a framework, with vastly more explanatory power than anything uniformitarianism can muster, is now within our reach. It is time to move beyond throwing stones at the uniformitarians (and each other) and work together to offer the world this positive alternative. It is time for constructive action. I thank Andrew Snelling, Steve Austin, Larry Vardiman, Russ Humphreys and Kurt Wise for their thoughtful and constructive reviews of the articles I have submitted to this forum. John Baumgardner has a B.S. in electrical engineering from Texas Tech University, a M.S. in electrical engineering from Princeton University, and a Ph.D. in geophysics and space physics from the University of California, Los Angeles. John is widely acknowledged as the architect of the world’s leading 3-D supercomputer model for planetary mantle dynamics. John has served at the Los Alamos National Laboratory as a technical staff member in the Theoretical Division since 1984. He is author of many papers on the dynamics of the mantle of the Earth. Back to Forum Index . Humphreys, D.R., Physical mechanism for reversal of the Earth’s magnetic field during the Flood; in: Walsh, R.E. and Brooks, C.E. (Eds), Proceedings of the Second International Conference on Creationism, Vol. II, Creation Science Fellowship, Pittsburgh, pp. 129–142, 1991. See also Humphreys, D.R., Has the Earth’s magnetic field ever flipped? CRSQ 25(3):113–126, 1988. Return to text. Baumgardner, J.R., Computer modeling of the large-scale tectonics associated with the Genesis Flood; in: Walsh, R.E. (Ed. ), Proceedings of the Third International Conference on Creationism, Technical Symposium Sessions, Creation Science Fellowship, Pittsburgh, pp. 49–62, 1994. Return to text.